Now I'm saying "solved", however, that may be a little optimistic. Improved would possibly be a better description. Or attempted even. If you mouth the letters "p" and "b" you'll noticed they sound very similar, and are made by the mouth in a very similar way. This is likewise the case for "v and p", "d and t" and "g and k". If you mouth out the letters "p" and "b" you will notice that the sound "p" sounds like a "b" - only with a "push" of air coming out of the mouth. In fact, if you hold the palm of your hand an inch or so away from your mouth you'll feel this push of air on the palm of your hand. As you mouth the "b" sound there'll be a slight push of air on your hand, but then when you mouth the "p" sound you'll feel a much noticeably larger push. Therefore I surmise that the "p" consonant is simply a "b" with a push of air from the mouth. 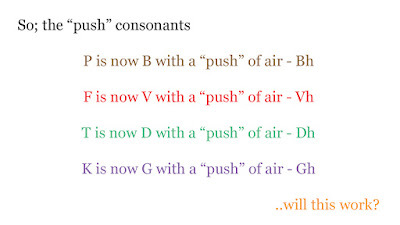 I also mentioned in my last post the consonant H, and how this unique consonant is simply a breath of air. Again if you sound out the "h" sound you will notice this. It's essentially a breathing or panting sound. 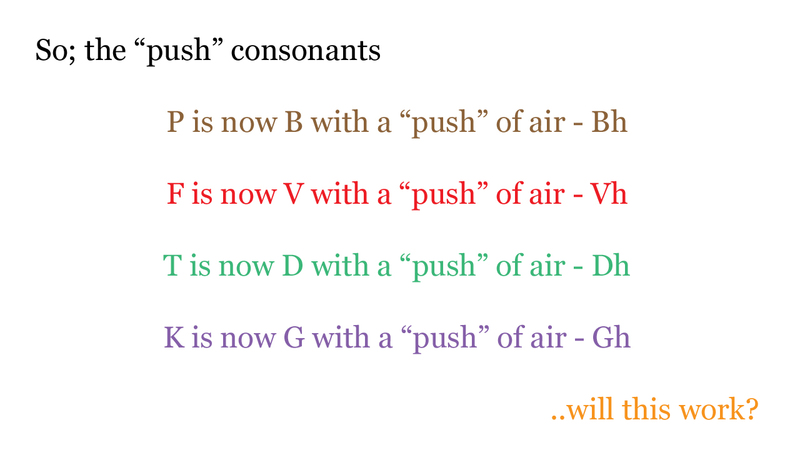 So with this knowledge it may be reasonable to represent the consonant P by the combination of a B and a H. A "B" with a push of air. Now as I've mentioned in previous posts this isn't necessarily going to be a perfect substitution. However, my hope is that it'll be a close enough approximation to do the job. I would also suggest the same for the other three word pairings. "f" is a "v" with a push of air. "t" is a "d" with a push of air. "k" is a "g" with a push of air. Again sounding these letters out in the mouth may help. 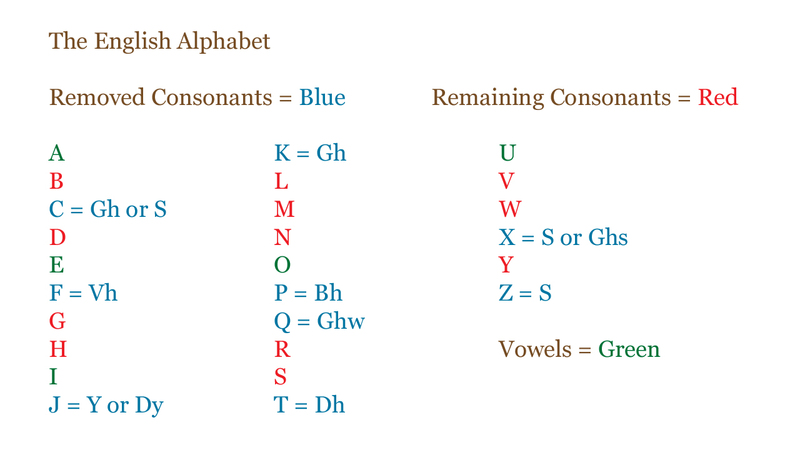 So, in my new reduced alphabet, the consonant F can now be represented by a V with a H (Vh). The consonant T can be represented by a D with a H (Dh). And the consonant K can be represented by a G with a H (Gh). Now these new substitutions will no doubt play havoc with the English language. Especially visually. It will look very unlike normal English. Even more so than was the case at the end of my last series (see here; Konstellation Konsonants: Part 9 ). In my next post I'll trial these new substitutions to see how well (or unwell) they work. I'm guessing there'll be plenty of problems that arise. Particularly with the disappearance of the letter K which was already acting as a substitute for the letters C, X (with the "ks" sound) and Q (with the "kw" sound).